Mark Oxley is set to make an immediate return in goal for Hibs in tomorrow night’s Championship clash with Rangers at Easter Road despite Conrad Logan’s Hampden heroics. Logan, playing his first game in 16 months as Oxley sat out the Scottish Cup semi-final against Dundee United due to suspension, turned in a man-of-the-match performance, capping it with two tremendous saves in a nerve-wracking penalty shoot-out. But, while the 29-year-old afterwards insisted he was ready to face Rangers in what many will see as a dress rehearsal for next month’s final between the two clubs, Hibs head coach Alan Stubbs today insisted Oxley remains his No.1. Admitting Logan had a game he will remember for a long time at the weekend, Stubbs revealed he’d actually decided to play the Irishman a week ago, rather than Finnish Under-21 internationalist Otso Virtanen. He said: “Personally, it wasn’t a tough decision. As always, it was made in the best interests of the team. 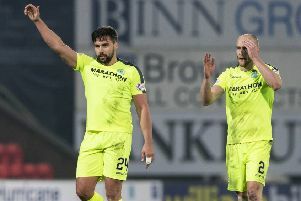 Stubbs pointed to the three one-on-one saves Logan had pulled off during the course of the game in which Jason Cummings had blown the chance to put Hibs ahead from the penalty spot as proof of experience counting. He said: “I felt we played quite well in the first half without probably converting our pressure into chances and United then came into a bit more. Conrad made good saves, but that was more about being in the right place at the right times. That’s when experience does help. “Conrad had a game he will remember for a long time but Mark is my No.1. Conrad has done himself no harm whatsoever with his performance. “He has made the competition for places even greater but, as long as Mark is available, he will be back in. Stubbs admitted many might see tomorrow’s match between the Scottish Cup finalists as an indicator as to how the showpiece match on May 21 might go, but he insisted it would have no bearing whatsoever. He said: “It won’t have any relevance. People might see it in whatever way they want, whatever the outcome might be but it will have no significance for the final. “That will be a one-off game as were the matches at the weekend. We’ve done well in such games against Premiership clubs this season. We’ve only lost once in eight and, between us, Hibs and Rangers have beaten first, second and third in the top league. “The final will be a huge game but we have a lot of huge games coming up. I think that’s brilliant.